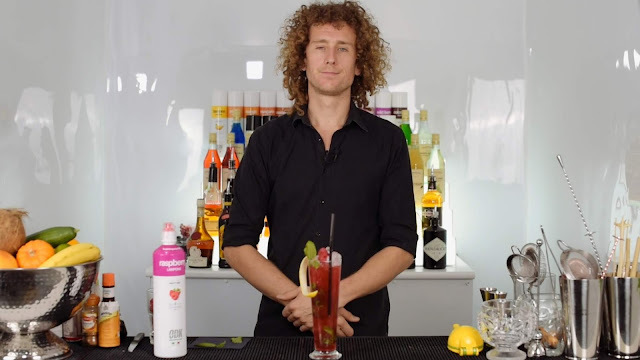 In the third edition of our monthly cocktail recipe blog, award-winning flair bartender Tom Dyer shows you how to make a delicious raspberry lemon tree cocktail – perfect for those long summer nights. Thanks to the inclusion of the ODK raspberry puree, this recipe is remarkably quick and easy to make. Fond favourites of bartenders all over the globe, the ODK purees deliver a superb three-month shelf life, incredible convenience and – above all – a lusciously fresh taste. So, what do you need to make a delectable raspberry lemon tree cocktail? Add white rum into your glass using a spirit pourer. Using a pour and store, add your passion fruit juice to the glass. Pour your Chambord into the glass. Slap the mint leaves in the palm of your hand to release the full flavour of the oils. Then place into the glass. Cut your lemon in half and squeeze one of the halves into the glass using your lemon juicer. Squeeze your ODK raspberry puree into the glass. Add ice cubes all the way to the top of the glass. Vigorously stir with your bar spoon while covering the top of the glass with a napkin to prevent spills. Add more crushed ice until you reach the brim of the glass. To make the lemon twist for garnishing, cut the remaining half of your lemon into thin slices. Then, cut a straight line from the middle of the lemon all the way to the rind. Cut off the pulp so that you are left with one long strip of peel. Finally, twist one side backwards and the other side forwards until you are left with a curled-q shape. Garnish with your lemon twist, a mint sprig and a handful of raspberries. Your summery raspberry lemon tree cocktail is now ready to serve. Why Not Try Some More Of Tom's Delicious Recipes?